OX CART FACTORY IN COSTA RICA! In December, 2018, I visited the Ox Cart Factory in Sarchi, Costa Rica. It was established in 1923 and operates today much as it did then. Wheels were made with steel rims and were huge. The most interesting thing about the factory is that is was a pre-industrial revolution factory. The power for the line shaft came from a stream that flowed for 2 miles before turning a large waterwheel which in turn powered numerous belts throughout the factory. These belts ran all the machines in the factory including saws, drill presses and stamping machines. They only make large ox carts today if specially ordered and they cost about $6000; however, they have a huge store with small ox carts for tourists and for tourist rides. They also sell comfortable rocking chairs which they ship to the US. Take a look at Costaricanmarket.com. The history is set out in the Tico Times, the Costa Rican English language newspaper. Well worth the trip just to see the waterwheel in operation. GERTRUDE AND BERTHA, GREAT AUNTS, WHOSE UNIQUE LIVES WERE DISCOVERED THROUGH GENEALOGY! When I was between 5 and 10 years old, in the late 1940’s, I used to visit my grandparents in Villisca, Iowa. I would spend time with my grandfather’s two sisters, who were in their 60’s, and who were unlike any other women (housewives) that I knew. My recent interest in genealogy has proven how unique they were. 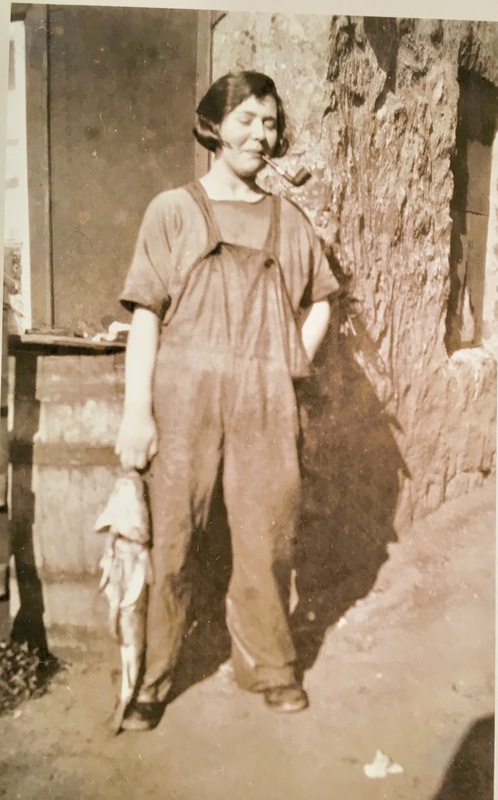 Gertrude Winifred Tyler was born in 1882 in Villisca, Iowa. She graduated from Simpson College in Indianola, Iowa in 1909 followed by a Master’s Degree in Education from Columbia University in New York. In 1913 she opened Stevens Memorial Suining Girls Boarding School in Suining, Sichuan, China, for the Women’s Foreign Missionary Society of the Methodist Episcopal Church. She ran the school for around 30 years. During this time she made numerous trips back to the US and I found her name listed as one of 19 US Citizens on the passenger manifest of the Nippon Maru, which arrived in San Francisco from Yokohama, Japan on July 16, 1919. Gertrude had a large collection of Chinese wall hangings and artifacts. I have some of the hangings, but most of her collection is now in the Villisca Public Library. Aunt Bertha, taught school in Orient, Iowa, graduated from Simpson College in 1912 and received her Master’s in Education and Psychology from the State University of Iowa in Ames, Iowa. She was then a school principal in Orient, Iowa and the Superintendent of Schools in Orient, Iowa for 16 years. From 1934-1938 Aunt Bertha lived in Little Rock, Arkansas where she was the Dean of Women and Professor of Education for Philander Smith College, a college established in 1877 for freed African-American Slaves and still in existence and thriving today. The school was supported by the Methodist Church. I wrote to Philander Smith College and they sent me an electronic copy of the 1935-36 College Catalog, which lists Bertha as the Dean of Women and Professor of Education. It also shows that tuition was $27 per semester, room and board was $15 per month and laundry was $4 per year. Tuition is now $12,564 and board and room is $8,250. In 1938, Frank P. Tyler, Gertrude and Bertha’s father was in ill health. Gertrude and Bertha, abandoned their fascinating careers and came back to Villisca to run The Tyler Ice And Coal Company and the family slaughter house, which fascinated a 9-year-old boy on summer vacation. The ice plant consisted of a huge room with a saline solution where they froze water into 100 pound blocks of ice, which were then split into smaller blocks and delivered throughout Villisca, as everyone still had ice boxes after WW II. Another part of the ice plant consisted of lockers where people stored their frozen food until they were ready to use it. The predecessor to the ice plant was a pond where they cut ice in the winter, stored it in warehouses insulated with saw dust and sold the ice in the summer. The slaughter-house was a few blocks a way and only a small building where a couple of cows and pigs were slaughtered each week. The animals were shot with a .22 rifle and hoisted up on a winch to bleed out before being cut up. Gertrude and Bertha made blood pudding out of the blood and used every part of the animals. My genealogy research so far has been on the internet; but, the next step is to track Gertrude and Bertha on the ground; visiting actual sites in Villisca, Iowa, Indianola, Iowa, Orient, Iowa, Columbia University, Ames, Iowa and maybe even Sichuan, China. It will be my own Genealogy Road Show, but will be on-site. Last summer, my wife and I tracked her paternal and maternal ancestors through upstate New York and had great luck with local libraries, historical societies and genealogical societies, not to mention court houses and cemeteries. Several weeks ago we went to visit a relative in Orange County, CA. We were supposed to go to Alpine, CA, but due to the fire situation, we ended up at their home in Orange. A homeless family of feral cats had taken up residence outside their front gate; a mother and two small kittens. By chance, they trapped the female kitten in a fenced area next to the garage and adopted her. When we arrived, the kitten had disappeared. They had kept it in a closed second bathroom along with their washer and dryer. The cat was gone. Using tuna as bait we hoped to entice the cat out of its hiding place. We thought she was behind the washer and dryer. The tuna was set out, and a string was tied to the washer/dryer closet door. The cat would come out, we would see the cat, jerk the string and prevent the cat from going back behind the washer/dryer. Nothing happened! For several hours we watched the door and held the string. Nothing. We took a break, shut the bathroom door and a short time later, the tuna was gone. Prior to our arrival, a four-foot cat cage had been delivered for the cat. We took a break and put the cage together; not a simple task, but the feral kitten could not run free. The cage being ready, we turned our attention back to the bathroom again. Nothing. No cat. No tuna. We went to Best Buy and bought a wireless camera that could be hooked up to a cell phone. We placed the camera in the bathroom and aimed at the washer/dryer and another helping of tuna. After some time, the cat appeared, ate the tuna and disappeared; but not in the direction of the washer/dryer. We pointed the camera at the sink and toilet and set out another helping of tuna. At 11:00 at night the cat came out, ate the tuna and disappeared behind the sink. We caught it on the cell phone. On checking the base of the sink, we discovered it was hollow and the kitten was hiding inside the base. The kitten was moved to the cat cage and kept there except when it was being held. It is still feral – look at its eyes – even when it is being petted. The mother and the brother are still waiting outside the house, but the sister is on the way to domestication. Since this was first written, the mother has given birth to 2 or 3 more kittens; more feral cats. The next step is to catch the mother and take her to the vet for a bit of surgery. Makes one wonder about all the feral children that are being separated from their parents at the border. But maybe being kept in pens with dozens of other children is not the same thing….. Maybe I just imagine that I see the kitten we captured in those kids. It is amazing how much the cat cage looks like the cages for immigrant children being held near the border. Old people are stupid! Including me. I think I am the same person I was 20 years ago, even though my daily visit to the mirror tells me different. I think I can do the same things that I did 20 years ago, and that there will be no consequences. The worst thing is I think I am as competent and as smart as I was 20 years ago. WRONG! Old people need hints to make life easier and more convenient, not to mention safer. The idea is not to live long, but to live well for as long as you can. Living in rehab is NOT living well. There are a few steps you can take. I will post them as I think of them and you can do with them as you please. REMEMBER: Don’t focus on longevity, focus on living the best life that you can, while you can. Why are grab bars important to old people? You are prone to falling after a certain age. Grab bars are usually only in the tub or shower. Towel racks are not changed out. Yet, if you get out of a tub, the first thing you will grab for is a towel rack. So, why not replace the towel rack with a grab bar. One time grabbing hold of your old towel rack will convince you. Look at your towel rack. It sort of hangs on to a couple of screws. How many times has it come apart when you tried to hang a towel on it? You usually don’t wear your alert button in the shower. You usually shower alone; unlike years ago, a dim memory, if you even remember. Consider showering with a friend – for your own well-being, but two old people trying not to fall gives rise to a whole new blog idea. The bottom of the tub or shower tends to be slippery, thanks to soap. It may take hours, or days, to find you if you live alone; or if your spouse is of questionable competency. If you break something, it is a trip to the hospital; then to rehab; then to assisted living: then ………. You may have locked the bathroom door. You don’t have your cell phone handy; and, it is usually not charged. And, you may not be any good at using it. You will feel like a fool lying naked on the bathroom floor when the para-medics break down the door to get you; or, when a friend who hasn’t heard from you for a few days comes to check on you.